Children's Picture Book Database at Miami University | Komodo! A young boy who loves dragons, goes with his parents to the Indonesian Island of Komodo in hopes of finding a dragon. 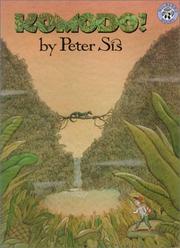 Sis, Peter, “Komodo!,” Children's Picture Book Database at Miami University, accessed April 21, 2019, https://dlp.lib.miamioh.edu/picturebook/items/show/8827.